Posted August 28, 2014 & filed under In the News. U-C Berkeley researchers, tapping Wellntel aggregated data for groundwater models, are experiencing the power of rich data – what some call “ground-truth” – in assessing the condition and future of the resource. Here’s an except from a recent article about Wellntel’s collaboration with UCB scientists in California Magazine. “The current problem, the [U-C Berkeley] researchers say, is that while satellite data can show how much groundwater there is on a regional level—in the Central Valley, for instance—it can’t capture how much there is under a city, or at the farm level. There just isn’t enough data from U.S. wells to get a deep understanding of how groundwater flows. 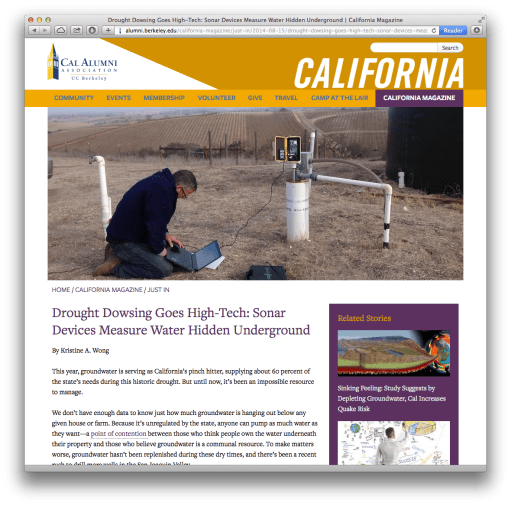 The predominant techniques used to measure well water levels—measuring tapes or pressure sensors—are labor-intensive and costly.